Updated on April 9 and 11 at bottom of post. “Climate is the continuation of oceans by other means”. In was in 1992 he wrote in Nature appealing to the Rio conference to use the UN Convention on the Law of the Seas (UNCLOS) to better manage human impacts on the oceans, and thereby address climate concerns. Needless to say, that call fell on deaf ears. Dr. Bernaerts is certainly a man worthy of respect and admiration–an expert in maritime law, a passionate marine conservationist, and an historian of naval warfare. All of these are subjects where I have little background knowledge and much to learn. It takes some time to understand how his material is organized, with several websites to explore, but there’s lots of data, naval history, graphs and charts to peruse and expand one’s understanding. Elsewhere he theorizes that the stirring action of great and increasing numbers of propeller-driven vessels releases ocean heat into the air, beyond what naturally occurs. He doesn’t claim this is proven, but rather it has been ignored and not studied. He also believes that future cooling is as likely as warming, contrary to what consensus scientists expect. I appreciate Dr. Bernaerts’ perspective and will be reading more of his extensive work. Contribution from Ships, Fishery, Wind-parks etc. Ron; Your essay is highly appreciated. Thanks a lot! As COP Paris is approaching quickly, your presentation is very helpful for raising more interest and discussion on ‘oceans make climate’, about which I would be ready and happy to assist you in exploring my research material, and concepts of the various analyses, as it may otherwise “take some time to understand how his material is organized….” covering the last quarter century. Dr. Bernaerts, thanks for your comment. I am glad my overview of your work was not too far off. As you can see from my posts here, I am a generalist with a scientific curiosity. Truth be told, I paid zero attention to global warming prior to COP Copenhagen. At that event was the spectacle of nations pledging reductions in fossil fuel emissions, and the pledged amounts totaled up to forecast temperatures at the end of the century. Amazing! When did we so well understand the climate system to project the future in hundredths of degrees? So I started reading, and soon learned it was a circus act, or even worse a side-show con game. My point: The notion of CO2 as the “climate control knob” offended my sensibility that such a complex reality could be so simply explained. At the time, I could only say to my friends (who think I am obsessing over this issue) that we are only experiencing natural variability. That is true enough, but I and others like me need an alternative theory of what drives changes in the climate. That is why your phrase struck me. In the water world post, I noted that global SSTs fluctuate in the same periods as the IPO, and the same patterns appear in surface temperature records. This suggests that the oceans are the source of natural variability, and I believe that is your premise. Here’s what I want to learn from you. What is the theory, the mechanisms and the evidence for your assertion: Oceans make the climate. Please point me to the writings. Remember that I am a generalist who needs to grasp the core principles underneath the complexity of your specialized knowledge. The idea that shipping could be releasing heat from the oceans has not been discussed much before. 1) I would have thought that current shipping volumes far outstrip any wartime naval activity. 2) Propellers warming the oaceans? This warmth is just part of the energy of burning the shipping’s “fossil” fuel. Heat generated by burning fuel is surely not a significant factor in global warming? A lot is said about the generated CO2, but I have not seen any reports addressing the heat by burning. Agitation of the surface layer and exposure of subsurface warmth is the mechanism proposed, as I understand it, not conversion of energy from propellers. “Subsurface warmth”? Is this the missing warming hiding in the deep? Anyhow, propellers can surely not affect anything but the surface layer? It seems that the top 200 meters are heated by sunlight. But the warmest water is near the surface and the ships churn the top 15 meters. I too would like to see studies that assess the scale of this effect compared to natural turbulence. 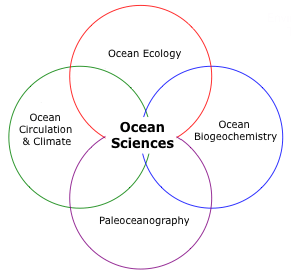 My interest is in understanding how climate is affected by the oceans, both natural and human factors. Thanks for your interest. Let me first outline the main parameter in brief (1), followed by an outline on the two major climatic changes since 1850 (2). •	At about 1850 the Little Ice Age ended and screw driven vessels entered the scene. •	this means a large exchange of warm to colder water or vice versa. •	Any downward exchange happens immediately, and become part of the internal structure (heat and salinity). 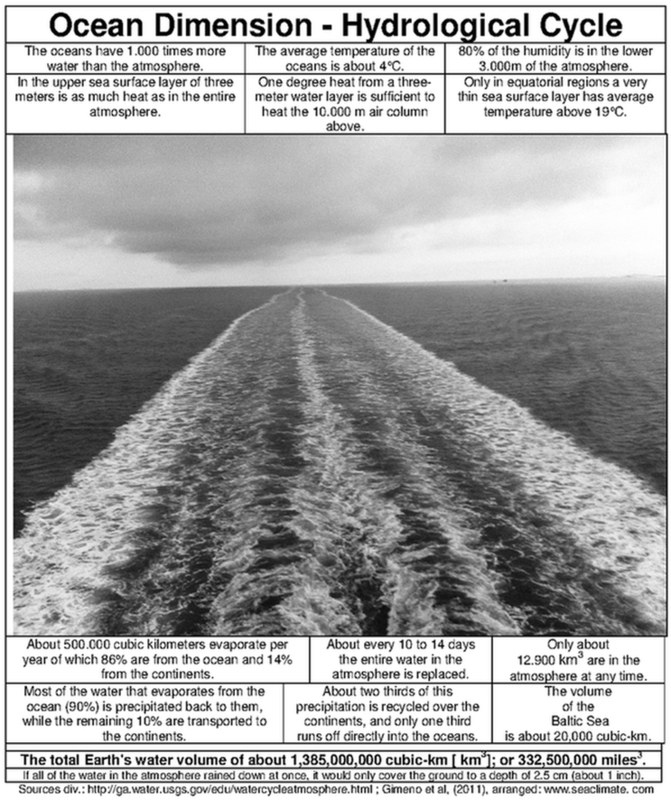 Any interaction between sea surface and the atmosphere happens only under certain (complex) conditions. •	The net impact is that the oceans presumably take in more heat as it release again quickly. 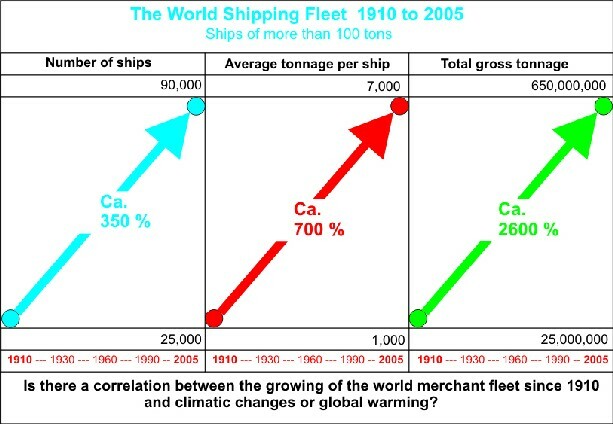 •	160 years shipping and other ocean uses may have significantly contributed to global warming since 1850 (for example over the night, winter season). •	As very little (at best) is known about this processes, the two major climatic changes provide helpful clues. 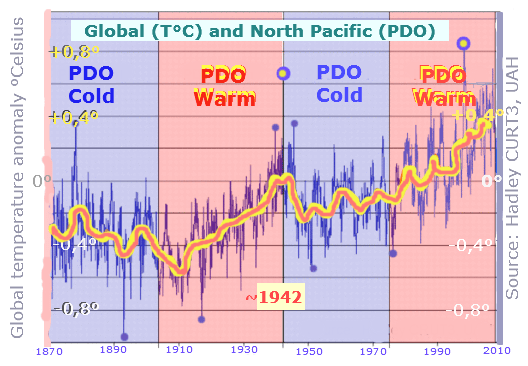 (2)	The main aspect of the two climatic changes, 1918/19-1939 & 1939/40 to mid-1970s. __Arctic Warming at the end of First World War, disussed in a book 2009 (p.106) at http://www.arctic-heats-up.com/ , when winter temperatures exploded at Svalbard, subsequently in the Atlantic sector of the Arctic Ocean, warming the Northern Hemisphere until WWII (USA until about 1933, Europe until 1939).The cause was likely a significant shift in the water structure (before and behind the Fram Strait), due to enormous naval activities around Great Britain that changed to heat and salinity structure of water masses from west of GB to the North Sea that all flows north. Naval war is the likely main contributor of this warming. A. The three extreme war winters in Europe, the coldest for one hundred years. In my latest book (2012) –online : http://www.seaclimate.com/ – I discuss this event over about 175 pages (from a total of 220 pages), as each winter has specific features, as well with regard to naval activities. Europe’s sea areas (including the North and Baltic Sea) have stored a maximum heat by the end of August, which is usually released until end of March. Stirring hot coffee will cool it down; 1000 naval ships and other war activities at sea either. Cold air from Siberia can take reign. That is anthropogenic climate change pure based on a large scale experiment with climate. Prima facie naval caused this three extreme winters. B. The North Atlantic and the West-Pacific became a major naval battle ground after Pearl Harbor in December 1941, which was able to operate and penetrate the sea surface layer down to 200 meters depths, not to mention ships, and airplanes sunk, and the many million shells fired. Global cooling established for three decades, because several years’ war at sea generate a huge chaos in a very complex water structure (heat & salinity), which needed more than three decades to ‘recover’. The three extreme winters in Europe “tell it all”. Climate sciences had seven decades time to analyze the ‘large scale field experiment”. A thorough understanding would definitely establish that naval war activities was the major cause, which subsequently would inevitable require to investigate the Arctic warming and global cooling as a naval war related matter (to a very noticeable degree) as well. Actually, understanding “Climate as the continuation of the oceans by other means” would have raised alert more than one century ago that screw driven vessels and other human activities at sea may change the sea in a way that alters weather and climate. Ron; I hope the brief text provides enough aspects concerning the subject. Your further kind assistance to get the message across would be highly appreciated. Thanks a lot, Arnd.